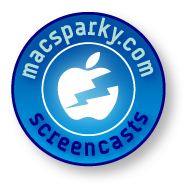 After a bit of a hiatus, I've got the screencast train rolling again. I rebuilt the opening graphics, moved the hosting to libsyn, and I'm now publishing in Apple TV format. Finally, I've been able to ramp up the production values a bit with ScreenFlow. This short screencast walks you through the process of setting up a smart playlist in iTunes that will allow you to sync 50 of your favorite songs to your iPod that you haven’t listened to in the last month. The smart playlist automatically updates itself so every time you plug in, you get new music. You can get it through iTunes or right here.